Perfect for the larger weddings. If you don't need so many, we also sell them individually - see below for details. Compare the TASTE, not just the price! This chocolate heart is made in Australia using 100% pure Cadbury® chocolate (pure Cadbury® Buttons melted down into hearts) - they taste just great! Don't be fooled by poor tasting imitations that are made with cheap and nasty compound chocolate that will leave your guests screwing up their faces due to the poor after taste! 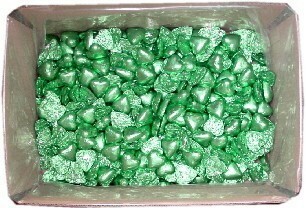 We've been selling chocolates to weddings for over 16 years and in our opinion these are simply the best available! You choose Express Post as your delivery method. In winter, Express Post alone is normally satisfactory. During warm to hot weather (late spring, summer & early Autumn), we strongly recommend you choose the "Add an Esky & Ice Pack to the shipping of your chocolate orders." - click on the image to the right or in the below in the related products. 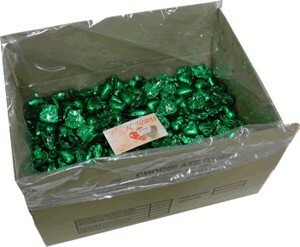 This will cost you a little more but it will help ensure your chocolates do not melt during transit. Accordingly, we generally do not dispatch chocolates on Thursday or Friday as we don't want them sitting in a hot warehouse or delivery truck over the entire weekend. We do not accept any responsibility for your chocolates melting during transit. Cadbury® Buttons are a beautiful smooth milk chocolate. They are similar in flavour and texture to Cadbury Dairy Milk® but not necessarily 100% identical. 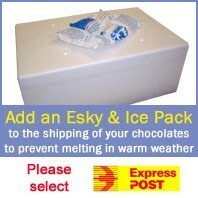 Esky & Ice Pack for Shipping of Chocolate Orders.